Department of Pharmaceutical Chemistry 1, Department of Pharmaceutics 2, Department of Pharmacology 3, SCES’s Indira College of Pharmacy, Pune - 411033, Maharashtra, India. MAEER’S Maharashtra Institute of Pharmacy 4, Pune - 411038, Maharashtra, India. 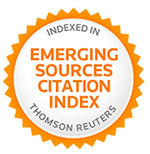 ABSTRACT: In the recent development, worldwide consumption of alcohol has shot up in the past decade as a part of lavish and Gen next lifestyle changes. There have been innumerable instances of people consuming alcoholic beverages and drugs at the same time. Hence in our study, Diclofenac and Metformin were selected as representatives of highly prescribed and overused drugs. Hence, the present study was planned to design dissolution media and to study drug release of different brands of the same drugs using newly designed media. Various hydroalcoholic media were prepared. 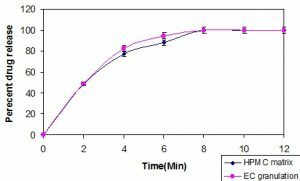 Optimization of new, chemically defined dissolution medium was done by comparison of release profiles of Metformin HCl and from Diclo IR 1, Diclo DR 2 and Diclo SR1, Diclo SR2 tablets of Diclofenac Na. The Metformin IR and Diclofenac IR tablets showed faster release in strong beer than mild beer and rum. It can be concluded that both the strength and volume play an essential role in the release pattern of IR formulations. The SR formulations of Metformin HCl and Diclofenac Na showed that the release was similar in 40% alcohol as well as rum. 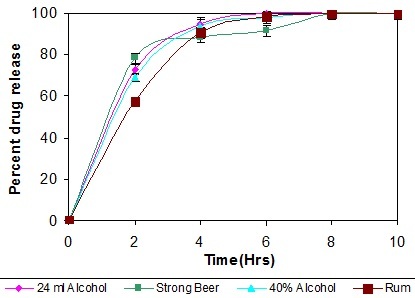 However, the release was somewhat slower in strong and mild beer indicating the effect of strength of alcoholic beverage. Thus, the phenomenon of higher and faster release pattern of the drug in alcoholic beverages is directly proportional to the concentration of the alcohol. Higher the alcoholic concentration, greater is the disruption of the formulation and faster the release pattern. INTRODUCTION: Sustained release dosage forms are the drug delivery systems of choice for the control of chronic diseases. The control over the release rate of the drug is due to excipients such as hypromellose (hydroxyl propyl methyl cellulose), ethyl cellulose, etc. Which have varying but quantifiable solubility in alcohol. Hence, the administration of such drug products along with consumption of alcohol may lead to dose dumping. Depending on the therapeutic indication and the therapeutic index of a drug, dose-dumping can pose a significant risk to patients, either due to safety issues or diminished efficacy or both 1. One of the pharmacokinetic studies in healthy subjects demonstrated that co-ingestion of hydromorphone with 240 ml of 40% alcohol, resulted in an average peak hydromorphone concentration approximately six times greater than when taken with water. This study also showed that 8 ounces of 4% alcohol (equivalent to 2/3 of a typical serving of beer) could in some subjects result in almost twice the peak plasma hydromorphone concentration than when the drug was ingested with water 2. Some modified-release oral dosage forms contain drugs and excipients that exhibit higher solubility in ethanolic solutions compared to water. Such products may exhibit more rapid drug dissolution in the presence of ethanol. Therefore, in theory, concomitant consumption of alcoholic beverages along with these products might be expected to have the potential to induce dose dumping. This potential mechanism leading to dose-dumping from an oral modified-release dosage form has not attracted much attention in the pharmaceutical science literature 1. The previous study in our laboratory evaluated the effect of alcoholic beverages like strong beer, mild beer, rum, and 40% alcohol on the release profiles of sustained-release dosage forms containing Metformin and Diclofenac. 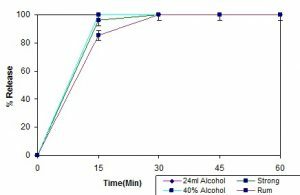 The results demonstrated that the drug release of the sustained-release formulations was faster in 40% alcohol and rum than in strong beer, mild beer and in water 3. Alcohol consumption has been a part of individual’s lives since ancient times. In the recent development; worldwide consumption of alcohol has shot up in the past decade as a part of lavish and Gen next lifestyle changes. Other aspects associated with ‘Lifestyle’ or longevity is diseases and disorders like diabetes and hypertension which are classic examples of a sedentary lifestyle. A jet- setting life and consequent indiscriminate use of drugs has to lead to constant consumption of pain killers. The scenario is worst as NSAIDs have become OTCs. There have been innumerable instances of people consuming alcoholic beverages and drugs at the same time. Hence in our study, Diclofenac and Metformin were selected as representatives of highly prescribed and overused drugs. Therefore, the present study was planned to design dissolution media and to study drug release of different brands of the same drugs using newly designed media. Materials: Ethanol (40% v/v) was a standard reagent grade (Baker, Germany). Preparation of Media: Commercially available cans or bottles of beer serve 300 ml of the beverage, and that is the minimum quantity of beer usually consumed at any single point. Hence, medium containing beer was prepared by diluting 300 ml of beer (strong beer 8% v/v, mild beer 5% v/v) with sufficient quantity of purified water to make 900 ml. Similarly, one peg of rum (40% v/v) represents 60 ml. Hence, this medium was prepared by diluting 60 ml of rum with a sufficient quantity of purified water to make the final volume. Moreover, a separate dissolution medium comprising of 40% v/v alcohol representing commercially available spirits (rum, whiskey, vodaka, etc.) was used. The volume of the same was 60 ml diluted similarly as described for rum. 300 ml strong kingfisher beer + 600 ml distilled water - HAM-SB. 60 ml rum + 840 ml distilled water - HAM-R.
60 ml 40% alcohol + 840 ml of purified water - HAM-A. 24 ml absolute alcohol + 876 ml purified water - proposed HAM. Six intact tablets from the same batch of each product were tested. The volume of dissolution media was 900 ml purified water maintained at 37 ± 0.5 ºC, and a basket speed of 100 rpm was employed. The amount of Metformin HCl released from the dosage form was determined using UV-Visible Spectrophotometer (JASCO MAKE) at 233 nm wavelength. The data obtained were analyzed using PCP-DISSO® software. Similarly, drug release studies were conducted in various hydroalcoholic media as mentioned earlier. Six intact tablets from the same batch of each product were tested. The volume of dissolution media was 900 ml distilled water maintained at 37 ± 0.5 ºC, and a paddle speed of 50 rpm was employed. The amount of Diclofenac released from the dosage form was determined using UV-Visible Spectrophotometer (JASCO MAKE) at 277 nm wavelength. The data obtained were analyzed using PCP-DISSO® software. Similarly, drug release studies were conducted in various hydroalcoholic media as mentioned earlier. RESULT AND DISCUSSION: Though the alcoholic beverages affect the release profile and have potential to cause fatal consequences, these media are far from being chemically defined, and different brands of alcoholic beverages may have different effects varying in the extent of serious, life-threatening consequences. Hence, it is essential to have a standardized, chemically well-defined medium. 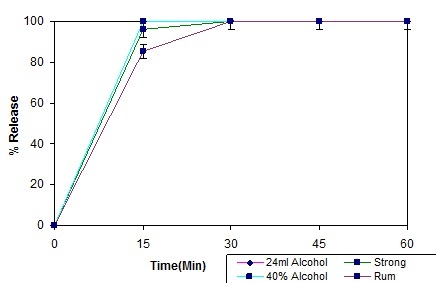 As results obtained from in-vitro dissolution test and ex-vivo test were conclusive about the effect of alcohol on dissolution and permeation pattern, the development of dissolution medium which will simulate the effect of various alcoholic beverages on SR dosage form was conceptualized. Theoretically, the alcohol content of 60 ml of rum (alcohol content 40%) and 300 ml of Kingfisher Strong Beer (alcohol content 8%) is similar, i.e. 24 ml of absolute alcohol. Hence it was decided to conduct drug release studies from marketed formulations of Metformin HCl as well as Diclofenac Na in the proposed new, chemically defined, hydroalcoholic media containing 24 ml alcohol. We evaluated similarity in drug release profiles between proposed newly designed chemically defined media (media containing 24 ml absolute alcohol) and rum and strong beer. Fig. 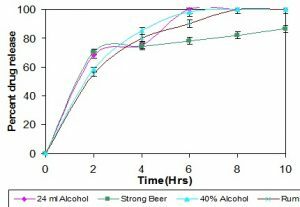 1-4 depict the comparison of the release profile of drug from Met IR 1, Met SR 1, Diclo IR 1 and Diclo SR 1 tablet formulations in the proposed hydroalcoholic dissolution media and medium containing strong beer, 40% alcohol, and rum. 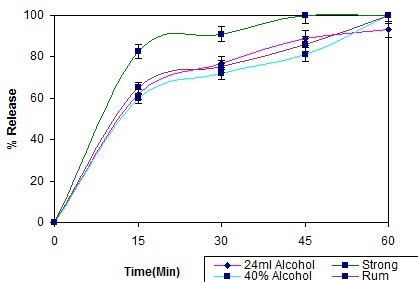 Similarity factor was calculated to compare the release pattern of the drug in media containing strong beer, rum, 40% alcohol with the release pattern in the proposed medium (medium containing 24 ml absolute alcohol). The high F2 values for Metformin IR1 and SR1 tablets indicate similarity between the release profiles. Hence it can be inferred that the medium containing absolute alcohol can mimic the conditions prevailing in the media containing rum, strong beer or 40% alcohol. It can be seen that for Diclofenac Na, a drug having poor water solubility and free solubility in alcohol, the F2 values are below 50. Though, this indicates dissimilarity, the values are close to 50. This can be considered a good indication of the similarity of dissolution conditions. To check reproducibility, repeatability, and precision of proposed standard dissolution medium, dissolutions using different brands of both the drugs were run in proposed medium. 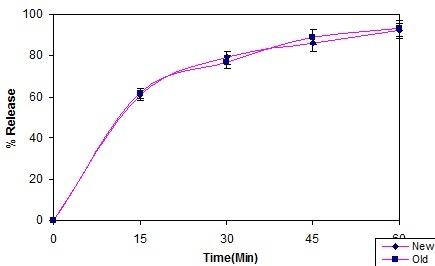 Optimization of new, chemically defined dissolution medium was done by comparison of release profiles from Met IR 1, Met IR 2 and Met SR 1, Met SR 2 tablets of Metformin HCl and from Diclo IR 1, Diclo DR 2 and Diclo SR1, Diclo SR2 tablets of Diclofenac Na. Fig. 5-8 depict the comparison between the drug release profiles of Met IR 1, Met IR 2, Met SR 1, Met SR 2, Diclo IR 1, Diclo IR 2, Diclo SR 1, Diclo SR 2 respectively in the newly designed, chemically defined medium. Further confirmation of this robustness of chemically defined medium can be seen from Table 4 which depicts the F2 values of drug release from different brands of Metformin HCl and Diclofenac Na. The high F2 values confirm the accuracy of the method developed. Reproducibility and repeatability of the dissolution method can be seen from the similarity in release profiles. 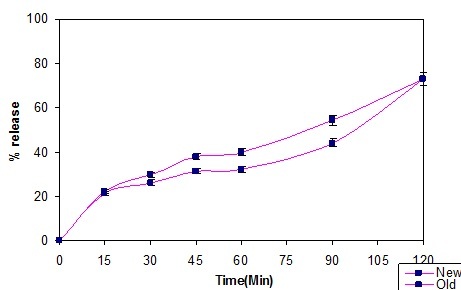 Sustained release formulations of both the drugs were prepared by using hydrophilic polymer HPMC (K100M for Metformin HCl and K4M for Diclofenac Na) and hydrophobic polymer ethyl cellulose (EC) 20cps 6, 7, 8, 9. The tablets were evaluated for thickness, hardness, friability, and weight variation. 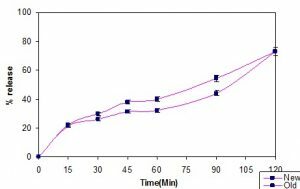 Sustained release tablets of Metformin HCl and Diclofenac Na were prepared by using commonly used polymers. The most commonly used hydrophilic polymer for this is Hydroxy Propyl Methyl Cellulose (HPMC) due to nontoxicity, easy handling and no requirement of a specific technology for production of sustained-release tablets. Ethyl Cellulose was selected because of its safety, Stability, hydrophobicity and compact film forming nature among water-insoluble polymers. For Metformin HCl, it is observed that 100% or near to 100% drug release is achieved in 6 h in Met EC and Met HPMC tablet respectively. For Diclofenac Na, 100% drug release is achieved in 8 hours for both Diclo EC and Diclo HPMC tablets.This may be due to the solubility of the drug. However, a faster release rate is observed for tablets containing EC than HPMC. This may be due to the higher solubility of EC in 95% alcohol. Values for HPMC matrices for both the drugs are above 50 indicating the similarity between the formulations. This might indicate that the marketed formulations are also matrix based. On the other hand, the F2 values of EC granulation formulation are below 50 indicating dissimilarity. This shows that the controlling mechanisms are different. However, it can be seen that the release rates for EC granulation formulations are faster due to the higher solubility of ethyl cellulose in alcohol than that of hydroxypropyl methylcellulose. The % of drug released from prepared sustained release formulations (Met HPMC Met EC and Diclo HPMC, Diclo EC) was fitted to zero, first, Higuchi matrix, Peppas kinetic models to find out whether the drug release patterns are same in marketed formulations (Met SR 1and Diclo SR 1) in newly developed chemically defined medium and best fit and n and K values were determined 10, 11, 12. ‘n’ value is an exponent showing the relation between the time and drug release. In other words, it depicts the drug release pattern. 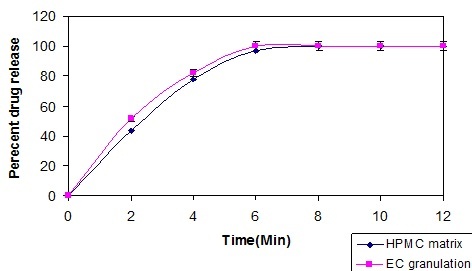 Generally, matrix type of release indicates that the drug release varies according to the square root of time while first order release profile shows dependence on drug concentration. Zero-order release is independent of drug concentration in the system. The changes in n values indicate a change in the mechanism of drug release. 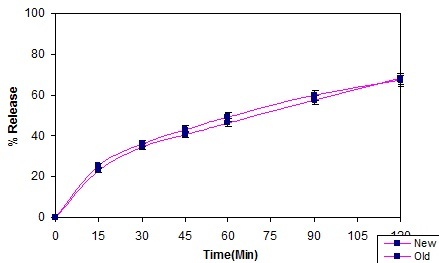 ‘n’ value of 0.5 or close to 0.5 indicates matrix release wherein the drug is embedded in the polymer matrix and drug release occurs by process of diffusion and erosion. 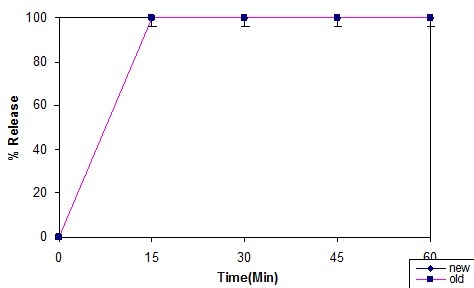 n values below 0.5 and towards 0 indicate drug release is occurring predominantly by the process of diffusion. This is a characteristic of membrane coated, reservoir systems. n value above 0.5 but below 1 indicate case II transport that is, the release is governed by swelling, diffusion and erosion of the polymer. It is observed that the EC coated drug tablets, have n values close to 0 in purified water but presence of alcohol release become matrix type increasingly. This is due to dissolution of EC in alcohol resulting in the formation of matrix. The system no longer remains a reservoir, barrier membrane diffusion controlled one but transformed into a monoblock of drug and polymer. In the case of HPMC matrix tablets, the release pattern in purified water shows n values depicting matrix or first order for both diclofenac and metformin HCl. In this case, apart from the contribution of the polymer, the release pattern is also affected by drug solubility. When the same matrices are put in an alcoholic medium, the disruption of the release controlling mechanism leads to significant changes in n values. For metformin, the ‘n’ value drastically changes indicating that the release becomes progressively first order, a characteristic of immediate release dosage forms. The change in ‘n’ values, further confirms the seriousness of co-consumption of alcohol and its potential to cause dose dumping. For the HPMC matrix, the ‘n’ value in the Power law equation is closer to 0.5 indicating Higuchi or Matrix pattern. 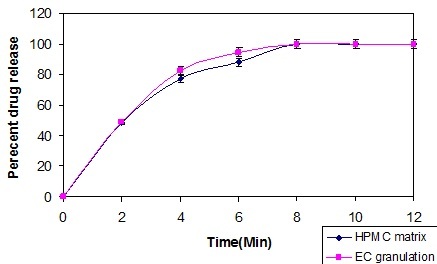 For EC granulation, the ‘n’ value is further away from 0.5 towards zero indicates diffusion through the membrane as the predominant mechanism of drug release as against the swelling controlled drug release seen in case of HPMC matrix. Hence, the factors that influence the drug release from the marketed preparation will also affect the drug release from the formulated preparations. This is evident from the results obtained. The significance of the similarity factor being so high is that irrespective of the composition, the dose dumping potential remains the same. This calls in for a remedy that is other than the formulation development and could very well be in the form of patient counseling by community pharmacist or prominent labeling condition in a language understood by a layperson. CONCLUSION: The present studies were carried out to establish a correlation between the alcohol content of beverages and drug release patterns of the controlled release dosage forms. In this study, Metformin HCl and Diclofenac Na were selected as representatives of highly prescribed and overused drugs and also as representatives of the drug used in lifestyle disease and OTC NSAID’s respectively. This study has successfully correlated the effect of alcohol consumption with drug release and dose dumping potential. Both IR and SR dosage forms of both the drugs were evaluated in the course of study. These two drugs belong to class III & class II BCS classification respectively. The Metformin IR and Diclofenac IR tablets showed faster release in strong beer (Volume = 300 ml; Strength = 8%) than mild beer (Volume = 300 ml; Strength = 5%) and rum (Volume = 30 ml, 60 ml; Strength = 40%). It can be concluded that both the strength and volume play an important role in the release pattern of IR formulations. The SR formulations of Metformin HCl and Diclofenac Na showed that the release was similar in 40% alcohol as well as rum. 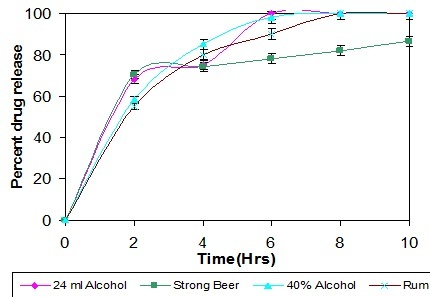 However, the release was somewhat slower in strong and mild beer indicating the effect of strength of alcoholic beverage. Thus the phenomenon of higher and faster release pattern of the drug in alcoholic beverages is directly proportional to the concentration of the alcohol. Higher the alcoholic concentration, greater is the disruption of the formulation and faster the release pattern. The change in ‘n’ values also indicates disruption of a drug release mechanism in case of SR dosage forms. To further substantiate the claims, a novel medium containing 24 ml absolute alcohol and 876 ml purified water was developed for evaluation of the release pattern of dosage forms in the presence of alcohol. The medium constitution represented various concentrations of alcohol in all the commonly consumed alcoholic beverages. The high F2 values indicating similarity in release profiles between various beverages and new, chemically defined medium indicate that this medium could give reliable results. The reproducibility of the results was seen in the similar release profiles of the same brands of drug formulations in different alcoholic media and developed media. The repeatability of the results was seen in the similar release profiles of different brands of drug formulations in developed alcoholic media. In accordance to the concern expressed by the FDA in 2005 (FDA, Alert for Healthcare Professionals. Hydromorphone Hydrochloride Extended-Release Capsules (marketed as PalladoneTM), Alcohol-PalladoneTM Interaction, July 2005), it can be concluded that a novel dissolution medium has been developed to check the robustness of formulations in case of concomitant alcohol consumption. The SR formulations of Metformin HCl and Diclofenac Na were prepared by using Hydroxy Propyl Methylcellulose (HPMC) and Ethylcellulose (EC). Drug release pattern of these formulations was studied in the chemically defined dissolution medium. When this pattern was compared to that of marketed formulation in the new, chemically defined dissolution medium, it was observed that HPMC matrix tablets showed similar release pattern as that of marketed formulations while EC matrix tablets showed different release pattern than the marketed formulations of both the drugs. This observation is in conformance with the industry’s preference of hydrophilic matrix technology for controlling the release rate of the drug from solid oral dosage forms. However, in both the cases the drug release was found to be faster indicating dose dumping potential. ACKNOWLEDGEMENT: Authors would like to thank the management of SCES’s Indira College of Pharmacy, Pune, Maharashtra, India for providing laboratory facilities. Robert JM and Ajaz SH: The Proceedings of FDA’s ACPS Meeting 2005.October. FDA, Alert for Healthcare Professionals. Hydromorphone Hydrochloride Extended-Release Capsules (marketed as PalladoneTM), Alcohol-PalladoneTM Interaction, July 2005. Joshi AM, Kadam SS and Pawar AP: The effect of alcoholic beverages on sustained release. Pharmaceutical Technology 2010; 34(12): 47-49. Indian Pharmacopoeia, Pharmacopoeia of India New Delhi, Ministry of Health and Family welfare , Govt. of India Controller of Publications 2015; 1020: 734-736. Ginski MG and Rajneesh TP: Prediction of dissolution–absorption relationship from a dissolution/Caco-2 system. AAPS Pharmsci 1999; 1(3): 1-12. Silvina AB, Maria CL and Claudio JS: In-vitro studies of Diclofenac sodium controlled-release from biopolymeric hydrophilic matrices. 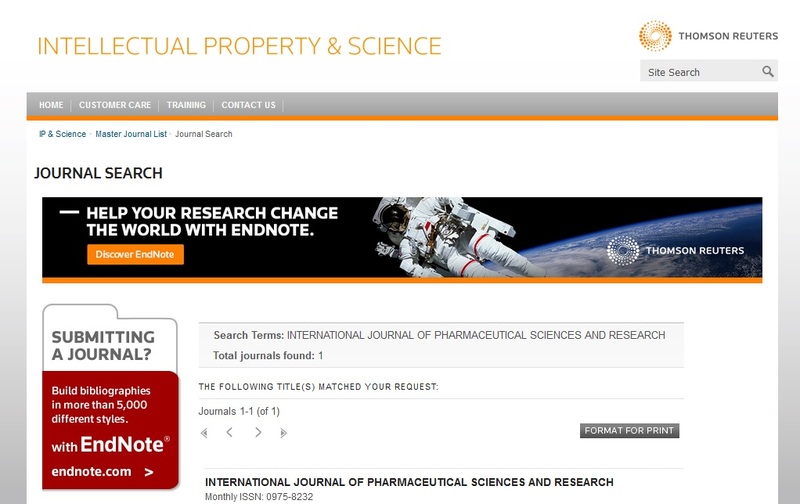 J. Pharm Pharmaceut Sci 2002; 5(3): 213-219. 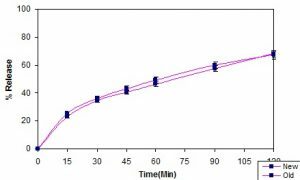 Malviya R, Srivastava P, Bansal V and Sharma PK: Formulation, evaluation and comparison of sustained release matrix tablets of diclofenac sodium using natural polymers as a release International Journal of Pharma and Bio Sciences 2010; 2: 1-8. Kathryn EU, Scott MC, Robert SL and Kathryn EU: Polymeric Systems for Controlled Drug Release. Chem. Rev 1999; 99: 3181-3198. Lachman L, Lieberman HA and Kanig JL: The Theory and Practice of Industrial Pharmacy. Varghese pub. House, 1987: 293-345. Harris S, Jaweria T, Hamid A and Rabia IY: Evaluation of drug release kinetics from Ibuprofen matrix tablets using HPMC Pak. J Pharm Sci 2006; 19(2): 119-124. Dash S, Murthy PN, Nath I and Chowdhury P: Kinetic modeling on drug release from controlled drug delivery systems. Acta Poloniae Pharmaceutica Drug Research. 2010; 67(3): 217-223. Paulo C and José MSL: Modeling and comparison of dissolution profiles. Eur J Pharm Sci 2001; 13(2): 123-133. 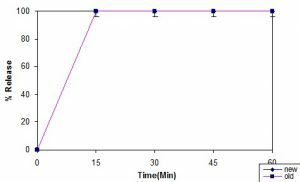 Joshi A, Shaikh A, Ingale S and Gothoskar A: In-vitro evaluation of effect of hydroalcoholic media on drug release from sustained release formulation. Int J Pharm Sci & Res 2019; 10(4): 2079-86. doi: 10.13040/IJPSR.0975-8232.10(4).2079-86.